There was a meme in my Facebook news feed that caught my eye this morning. I felt compelled to make some corrections to it. If you still don’t believe that Protestantism teaches progressive justification, think again. This verse is the crux of our reconciliation to God, not so? Jesus Christ dealt (past tense) with our sins so that we could be reconciled to God. It was a one-time event. 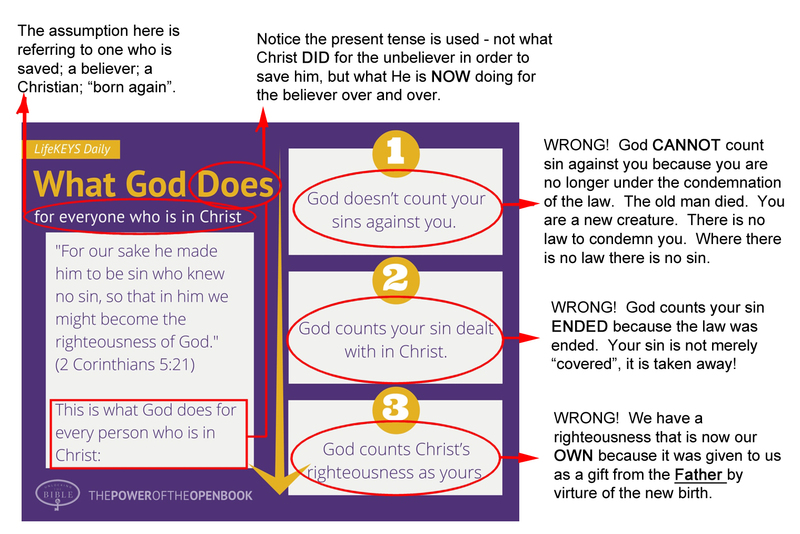 No, Christ did not become sinful as some preach (that’s blasphemy, peeps). Our sins were put ON Him; not IN Him. The chains of the Law were totally satisfied (blotted out; forgotten; demolished) by Jesus’ death, burial, resurrection. Amen, Andy, the righteousness was given to us by God the Father at the time when we were born-again. That was also the time that we became His children; not his enemies or lowly unworthy worms. Let Calvinism and the Reformed nonsense with its multiple imputations and endless blasphemies and blasphemers (R.C. Sproul Snr, for instance) be accursed! I dare anyone reading this to ask a Calvinist/Reformed puppet WHEN he or she became (past tense) born-again. Be prepared for some interesting, innovative, and anti-Biblical answers. Hint: Most are still being transformed into some sort of justification or have just always “known” they’re on their way to heaven. Okay, so when was MacArthur (the lying deceiver) saved? Does he have a date? (Go find out). A wise old preacher once told said, “if a man doesn’t preach the new birth, chances are, he’s not born again himself.” The testimonies I always heard in church had a specific time frame and it was important that everyone had their own tale to tell. Exactly right, otherwise, it’s some mystical LSD trip towards the “light.” It has no beginning and it has no end (until you fall off the cloud and slice your head wide open on the dirty pavement and its dirty dwellers and night crawlers). A wise preacher that was…Biblical dude.